Yesterday I spent hours trawling through Trove again as much has been updated since I last spent a lot of time there. I decided to hunt for my grandmother’s brother(s) who were excellent bagpipe players. I’d found a couple of articles the old-fashioned way by winding through hours of microfilm but Trove turned up much more. But back to Trove. What I found was the diverse involvement of these brothers in bagpiping events in quite diverse places. In 1906 Duncan & Peter are found competing in the Goulburn Highland gathering in NSW where they took out the 1st (Duncan) and 2nd (Peter) prizes in pibrochs, Marches (1st -Duncan & 3rd -Peter); strathspeys and reels (1st-Duncan). By the mid-1920s Duncan has moved to Canberra where he was Supervisor of the Joiner’s Section at the Kingston Power House during the construction and establishment of our national capital. Images of him are on the National Archives of Australia webpages (www.naa.gov.au A3560, 587). During his few years there he was obviously an early participant in the Canberra Burns Club when he judged the piping events at the first Highland Gathering there on 21 February 1925. (Found on Trove from Federal Capital Pioneer February 1925 page 5). He was again judge of the piping events in 1927 (The Canberra Times 3 March 1927, page 3). A year later he was killed in a tragic car accident in Sydney (clipping from my grandmother’s files & also at Trove from The Advertiser 23 November 1928 page 15). Meanwhile Peter had moved to Queensland on the arrival of his mother and other siblings as well as his wife-to-be. He once again was competing in various local events in Queensland. In 1914 and 1915 he competed in the Dalby Caledonian Society events with some success but many years ago I found a reference to a 1917 performance at Dalby when he won 6 firsts in piping and dance and 3 second places. 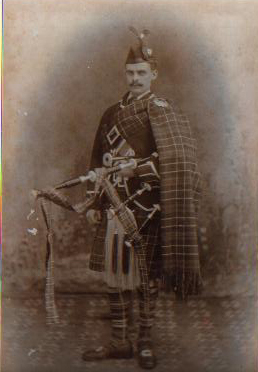 He plainly was not as good a dancer as piper but his rivals must have resoundingly wished him back in Glasgow (available through Trove but the scan has given poor results due to the print -I need to go back in and correct them). Mr R Kennedy seems to have been his biggest rival throughout this time. (The Brisbane Courier 28 May 1914, 4 June 1915, 9 June 1917). Peter was featured on the wireless (radio, to the youngsters among us) programme for 5 January 1927, playing a range of bagpipe melodies. (Cairns Post 5 January 1927, page 4). McCorkindale pipers-I assume Peter is the one in the middle and the others are either brothers, or friends/colleagues. Jam Session in Brisbane. No doubt there are other references in the papers to his piping expertise but the OCR isn’t always perfect and some of these may require more inventive searching. Strangely enough, despite Duncan & Peter’s piping successes, my father always said that their brother Malcolm was the better player but he was more nervous in performances. When Peter died in 1945, the Brisbane Caledonian Society & Burns Club band members were invited to attend and wear full dress. It would have been quite spectacular I think, and very moving. I hope I’ve given you some sense of how these Scottish immigrants contributed to their new communities and just how many family history “pearls” are contained within the Trove treasure box. The photos here came from my father’s cousin many years ago. 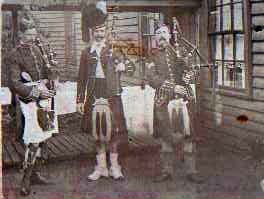 This entry was posted in Family History, McCorkindale Family History, Scottish Family History by cassmob. Bookmark the permalink.